We were Coventry Tournament Winners for the very first time. We were Runners Up at Wolverhampton where Mahal Warriors got their revenge in the Final. We completely outplayed them and were winning 1-0 when they fluked a goal, after we missed a penalty in normal time we were punished in the penalty shootout. We were Runners Up at Birmingham Tournament, once again completing 3 Finals in a year. Won Derby Tournament for the 4 th time in our history and came Runners Up at Gravesend . We won the Gravesend League Premier Division title for the first time ever in our history under the management of Terry Rai. We had to play the Gravesend West Indians (Old Comrades FC) in a double fixture on the last day of the season at Kings Farm. To win the league we needed to win both games, in front of a massive crowd we won the first game 2-0 and in the second game with the score at 1-1, the Windies were awarded a penalty, which was missed by Kenroy Bramble. Then a great through ball by Sheera Bains was converted by the electric (in those days) Jaswinder Bhens (Beano). Beano scored again near the end to make it 3-1. We took all 6 points to leapfrog the Windies to the Title. We were also Runners Up in the North Kent Sunday League Reporter Cup Final losing to Northfleet Scotts and Senior Cup Final losing to Scott FC. We won Gravesend Tournament for a record 8 th time, substitute Bahadur Atwal scored the winner in the Final to make it 2-1. 20 years after last lifting it we won the Dampier Palmer Cup again on Saturday's. The Sunday First Team got relegated to Division 1. Narinder Gill and Harpal Cheema took over the Sunday First Team from Bahadur Atwal and Khullar. The management had to reconstruct a team as we lost 5-6 players to a rival club in Erith. We were cruising to promotion with 4 games left, we needed just 3 points. Pressure crept in and we lost our next 3 games to bottom of the table sides and had to beat Top House in our final game, Top House had not lost a game all season. We beat them 7-1 to win promotion with Farouk Karim (Frukey) scoring a memorable goal. On Saturdays we were Runners Up in The Presidents Cup. We were Runners Up at Bedford Tournament. An amazing season for the Saturday First Team managed by Nirmal Dingri, in which we nearly secured the treble, was close to the quadruple, but did secure the double. This was the season a certain Frenchman Rachid Bachour (16 goals) formed an irresistible attacking partnership with Balbir Biela (37 goals), between them they banged in 53 goals. A young Jugjit Sian also pitched in with 15 goals and Captain Surjit Atwal scored 11 from defence (7 penalties). We had won the league by the end of March and some teams were so gutted that in the last 3 games they didn't even really bother to try (Clifton Utd 4-0 win, Rise Athletic 15-0 win, Swan Athletic 10-0 win). This was our second Gravesend Premier League Title win and after winning it so comfortably we applied for Kent County League Status – to improve the competitiveness of our matches. We were on top form and with the League secure we were confident we could take the 3 Cups too. But we bailed out in the Kent Cup at the Semi Final stage to Pfizer FC, a 2-0 loss. In the Quarter Finals we had beaten RACS with a Gurdeep Jutte goal. We did though win the Mallison Hospital Cup against Milton United 1-0 with a Balbir Beila goal. We missed out on the treble after being beaten in the Final of the Gordon Charity Cup, a 4-2 loss to Milton United, Beila and Beano both scored. Surjit Atwal was awarded Gravesend League Player of the Year. This was the second time a player from our club had won such an honour. In the Kent Cup on Sundays we were knocked out at the Quarter Final stage by some team from Eltham ways - a retired England International and Arsenal FC legend by the name of Kenny Sansom played against us that day - he also scored direct from a free kick past Harminder Bains (nickname Bungle). The Saturday First Team done the treble, we won the Mallison Hospital Cup, Gordon Charity Cup and Presidents Cup. It was decided we would only enter the Gordon Charity Cup from now on, even that we eventually stopped entering. The focus from now on would be the League, our bread and butter. Kam Khunkhun was Player of the Year. We were B Section Runners Up at Gravesend KFF Tournament managed by Narinder Gill. We lost on penalties to Shere Punjab Birmingham after a 1-1 draw. After the 5 normal KFF Tournaments two teams would then face off in the Annual North v South fixture (best players chosen from the South teams mainly from Gravesend, Southall/Hounslow and Barking v best players from the North teams mainly from Birmingham and Bradford). These were always great games - played with real passion and they carried with them immense rivalry. The North represented by mainly the untouchable team (at the time) of Smethwick Rangers including one of the tournaments finest ever Zah (Zahoor Sulliman) and other greats like Eggy (Iqbal Patel) and the beast Big Taj (Tejinder Basi) of Bradford. For the South Gurus had a host of players on show that day including Manjit Atwal, Surjit Atwal, Balbir Beila, Jaswinder Bhens, Hardip Gill, Kam Khunkhun, Jugjit Sian and Jess Gill. The South after a great end to end game walked away 2-1 winners. This was just one of the great matches of the North v South encounters - there were plenty more! We were now playing our Saturday football in the Kent County League – Div 3 West. We moved away from the Gravesend League to a more competitive League. In our first season in the Kent League we were Runners Up and won Promotion to Division 2 under the guidance of Nirmal Dingri. The Sunday Team won their first ever North Kent Sunday League Senior Cup managed by Narinder Gill and Harry Benning. We beat Milton & Denton in the Final 1-0, Hardip Gill got the winner. We won Bedford Tournament by beating Hitchin in the Semis and Bedford 3-0 in the Final, Balbir Biela and Hardip Gill amongst the scorers. We also won Watford Tournament by beating Bedford in the Semis and Hitchin 4-3 in the Final after being 3-0 down. Super sub Dave Dingri hit a hat-trick that day. Gurmit Pehal had done his trademark in our first game v Watford in this tournament - he got lobbed on the line! We won the Kent 5-a-side trophy for the first time in our history managed by Micky Helaith. Guru Nanak FC on Sunday 5th April 1998 played v The Mayors XI in a Charity Football Match at Gravesend & Nothfleet Football Ground, Stonebridge Road. All proceeds went to the charity of the choice of the Mayor. We played against Gravesend & Northfleet's Southern League Winning Side of 1992, managed by Gary Aldous with a team including Steve Portway, Micky Cotter and Lee Turner. In front of a 3000 crowd the Mayors XI beat the Gurus 5-4 in a highly entertaining and fund raising match. Balbir Beila and Jaswinder Bhens both scored twice each in this match. It was from this game that a scout from Gravesend & Northfleet FC then signed Beila on to play for them for a short spell. July 16th 1998 was one of the most memorable days in our history; HRH the Prince of Wales (Prince Charles) visited the club. Donations from the Princes Trust were made to the club and the visit marked the beginning of an exciting partnership with Premiership new boys Charlton Athletic FC. Charlton coaches started attending youth training sessions to develop young talent in North West Kent. The Saturday First Team was unlucky to finish third in Kent County League Division 2 West – we missed promotion by goal difference only….it was the most terrible and agonising way to miss out on promotion. This team had come a long way under Nimo, Division 1 of the Kent County League was missed by a whisker. The Sunday Team just survived relegation from the Senior Division, we had to win all 3 of our last games. Manager Narinder Gill was struggling for strikers and bumped into Narinder (Egge) Banwait (Noddy and Bel's brother) in the street. Egge hadn't kicked a ball for more than a decade, in his prime he was one of the most feared strikers around, a fox in the box. He scored numerous goals in his days for another Indian side called “Desh Bhagat” before he joined Guru's where he scored goals galore for 2 seasons. He was the type of player even if we were winning 6-0 at half time would still moan that it should have been 10, the complete workaholic footballer. Gill talked him into a comeback that day, and the following Sunday we played at Beauwaters against Hollisters. I remember players looking around in the dressing room and wondering who he was. Egge was named sub and with 10 minutes to go with the game at 1-1 he made his entrance onto the pitch. His very first touch ended up in the back of the net, a master finish from outside the box. He was mobbed by all the players in the celebrations. The next Sunday we played New Ash Green in a double header, we had a bare 11 with John Gill as the only sub. We managed to win both games with Egge claiming another winner. I believe if it had not been for Egge that season we would have went down. He retired again after that match. Sadly at the age of 38 in May 2003 he passed away, players past and present attended the funeral. We were B Section Winners at Leicester KFF Tournament managed by Kin Beila. In the First round we beat Sporting Khalsa Walsall 3-2 – Harry Sall, Happy Mudahar and Jess Gill got the goals. Quarters we beat Singh Sabha Hounslow 3-1 - Gurdeep Jutte, Perminder Bains and Sandeep Kooner got the goals. Semis we beat Southall Rangers 2-1 – Jess Gill and Happy Mudahar got the goals. In the Final we beat GNST Wolverhampton 3-0 comfortably with Gurdeep Jutte, Perminder Bains and Jess Gill (penalty) scoring. We gave away the title of Bedford Tournament holders, after beating GNG Luton 6-0, and Hitchin 2-1, we lost in an entertaining Final to Khalsa Bedford 5-4. 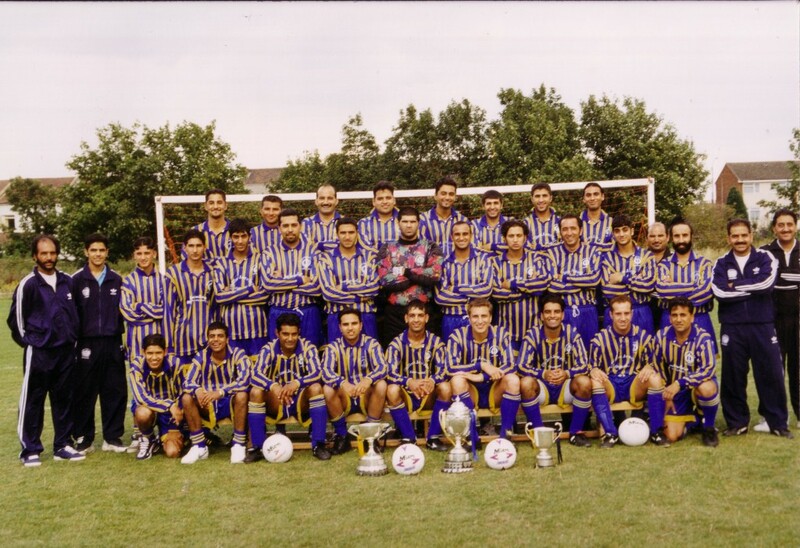 Guru Nanak FC on Tuesday 6th March 1999 played for the second consecutive year v The Mayors XI in a Charity Football Match at Gravesend & Nothfleet Football Ground. All proceeds once again went to the charity of the choice of the Mayor. We played against Gravesend & Northfleet current team this time (Jimmy Bullard's last game for The Fleet) In front of a very large crowd. The Mayors XI beat the Gurus 2-1 in a highly entertaining and fund raising match. Canadian signing Jatinder Thind scored for us. The winning goal was scored by Jimmy Bullard who after this played for Premier League teams West Ham and Fulham. On Sunday 9th August a Khalsa Football Federation (KFF) squad was selected to play against Millwall FC at their ground called The Den in London. Theo Paphitis (from Dragons Den) was the Chairman - and he was honored to make this fixture happen - as his vision was the same as KFF's - to see young Asian players come through to play the game at a professional level. This was a huge occasion and a groundbreaking event that the KFF take a lot of credit for - on the KFF Committee we had our very own Manjit Atwal and Makhan Cheema serving. Gurus Nirmal Dingri was part of the 3 man management team. Gurus players Kam Khunkhun at the age of 23 was chosen as was Balbir Beila at the age of 26. Millwall (Nigel Spink, Sean Dyche, Brian Law and Stephen Reid played for Millwall at the time) won 4-1 in a one sided game. After the disappointment of just missing out on promotion the season before a lot of players lost heart in the Saturday First Team and either moved clubs or retired. Sadly we got relegated back to Division 3, Nirmal Dingri resigned, Nimo had a very successful time in management spanning almost a decade. We won the Kent 5-a-side competition again. Micky Helaith for the second time managed the team to success. Balbir Biela and Surjit Atwal were superb throughout. The Sunday First Team managed to reach the Reporter Cup Final (our fourth appearance in a Reporter Cup Final). We faced The Sun at Gravesend & Northfleet FC. It was 0-0 at full time and 0-0 after extra time. Enzo Franco was playing for us that day - for The Sun his brother Rossi Franco was playing. We lost the resulting penalty shootout 5-3. Enzo missed his kick, Rossi did not ! On Sunday 15th August 1999 once again a KFF squad was chosen to take on Millwall at The Den - only this time they played their U21's. No Gurus players were chosen on this occasion - Millwall won 4-0. A KFF U14s youth select team were also chosen to play Millwall U14s. Three Gurus players were on show that day :- Baljinder Aujla (Goal Keeper), Jasmeet Bedi and a very young Amarjot Tiwana. So 2 defeats in 2 years.....the quality and standard of the tournaments was in serious question......just Asians kicking around in a park?